You'll feel right at home at Buena Park's Holiday Inn® hotel by Knott's Berry Farm. This full-service, nonsmoking hotel offers a superior location near major cities like Long Beach and Los Angeles. You won't run out of things to do at this Buena Park hotel. Pirate's Dinner Theater, Knott's Berry Farm, Soak City Waterpark & Medieval Times are within 1/2 mile. 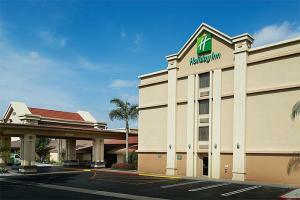 The rooms are light and spacious with a pleasant feel for both business and leisure travelers in Buena Park, CA. The hotel's free wifi Internet access is available in each room. Located about 20 miles from John Wayne Airport and 30 miles from Long Beach Airport. Pirate's Dinner Theater, Knott's Berry Farm, Soak City Waterpark & Medieval Times.